Contemporary to the history of north India, there was also another civilization in south i.e. the home land of Dravids Known as Dakshinapatha, which is now called Deccan. There are three sources that used by historians to reconstruct the early history of Deccan and south India. They are Ashokan inscriptions; Sangam literature; and Megasthenese’s accounts. According to these sources, South India lies south of the Narmada river beyond the Vindhya and Satpura mountains. But before going to History of Deccan and south India, we must have a look on the proto-history of that area. At that time, an extensive forest called “Mahankantra” laid between the two mainlands i.e. north India & South India and was less ventured into by the Early Aryans. So, south India remain secluded for along time. Not much known about the history of south India before the Iron Age. The first iron users in south India are known as megalithic people because they buried their dead and encircled it by stone or erected big stones on the spot of burial. Sometimes they made chambers using large stone slabs. Most famous megalithic sites are Khalpa, Takalghat, Naikund, and Mahurjhari in Maharashtra. Famous sites in south India are Brahmagiri, Maski, Hallur and Hardanhalli. In the 1,000 B.C., the life of the people living in the peninsula, were both nomadic and settled agriculturists. They lived by hunting and gathering and moved from place to place as well as cultivated a variety of cereals like rice and millet and kept cattle. Travelling led them to exchange various items, such as beads of precious stones and gold and perhaps iron artifacts as well. There is an abundance of black-and-red ware pottery which may have been made in the same way as that used further north. Among the agricultural tools archaeologists found iron hoes, sickles, axes, celts, hammers and ploughshares. Weapons like daggers, spears, knife and swords are found. Trident is also found. The burials of the megalithic people show that they had complex ideas about life after death and probably practiced elaborate burial rituals. Remains of horse with all its ornaments found in human burials. It appears that the horse was buried ceremoniously. Doubtless it was the horse which enabled them to travel the vast distances of the peninsula. When the Mauryas conquered parts of the peninsula there was already a distinctive culture exist in those areas. Some of the edicts of Ashoka are found in areas with important megalithic remains, for example, one found at Maski in the Raichur doab. On the decline of the Mauryan Empire these areas became independent. The new kings often belonged to families which had served under the Mauryas. Among them the best known was the Satavahana family, also known as Andhras. Capital of the Andhras or Satavahanas was situated at Pratisthan (modern Paithan in Maharashtra). They ruled for about 400 years from 1st century B.C. to 3rd century A.D. One of their greatest rulers was Satakarni who was a conquerer and was described as the lord of the west. He fought against the king of Kalinga. He probably ruled in the 100 B.C. Sometimes after the reign of Satakarni, the Shakas, who were ruling in Saurashtra, attacked the Satavahanas and pushed them out of Nasik and into Andhra. But the Satavahanas reorganised their armies and attacked the Shakas succeeding finally in regaining the western Deccan. This was done by King Gautamiputra Satakarni. The Shakas never missed an opportunity to attack the Satavahanas, and this continued into the reign of Gautamiputra’s son Vasishthiputra satakarni, until finally Vasishthiputra Satakarni married to the daughter of the Shaka ruler. Towards the end of the second century A.D. the Shakas became weaker than before and this gave the Satavahanas a chance to extend their kingdom. They conquered Kathiawar in the north and occupied the Krishna delta in the south. The empire of Satavahanas included Andhra Pradesh, Maharashtra, Gujarat, parts of Madhya Pradesh, and Rajasthan. Due to this, the Satavahana kingdom acted as a link between north and south India. Roads were built to provide communication throughout the northern Deccan in the Godavari and Krishna valleys. It was no longer unsafe to travel in these parts. Towns sprang up in the region of Nasik, and in the Godavari delta and also near Bombay, due to increase in trade. On the west coast, the port of Broach was used by ships coming from Persia, Iraq, Arabia and Egypt. The ports in the Godavari Delta lay along the sea route from the Ganga delta to south India. Ships sailed from these ports to Burma and Malaya. In the Satavahana kingdom the state was divided into provinces ruled by civil and military governors. The headman of each village was responsible for collecting the revenue or tax. The Satavahanas were succeeded by Rashtrakuts in Maharashtra and Ikshwakus in Andhra region. Allahabad pillar inscription of Samudragupta mentions names of some of these kings. 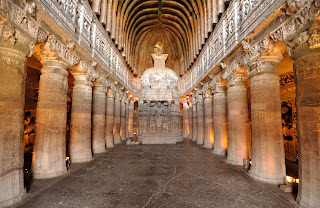 Though the satavahanas supported both Buddhism as well as Brahmanism, they built a number of Buddhist temples called chaitya halls where the Buddhists worshiped and monasteries called viharas where the monks lived. Many of the monasteries were built close to big cities, as for example the monasteries at Taxila (near Peshwar) and Sarnath (in the vicinity of Varanasi). This made it easier for Buddhist monks to go into the cities every morning and beg for alms. Some of the monks lived in monasteries which were huge caves cut into the hills, and these were also decorated with sculpture such as those at Karle and Bedsa (in the Western Ghats near Pune (Maharashtra). They also built many stupas (Stupas were large semi-circular mounds in which were placed the relics of either the Buddha or Buddhist monks). Therefore the stupas were sacred to the Buddhists. The most famous one was at Amaravati (A.P.). They also donated beautiful railings and gateways of Sanchi Stupa in Bhopal (M.P.). Ashvaghosha and Nagarjuna played an important part in helping the spread of Buddhism by their writings. In this period, those who had believed in the old Vedic gods were beginning to change. New gods were now worshipped and the cults of Vishnu and Shiva were acquiring support. This was the time when devotion to a god became more important than religious ceremonies. This was also the time when the teachings of the Gita became popular. In the extreme south part of India, three kingdoms arose. They are Cholas (whose centre was in the area of Tanjore, south of Chennai), Pandyas (whose centre was at Madurai), Cheras (along the Malabar Coast). Their names mentioned in one of the Ashokan rock Edicts. The main source about them is based on literature called ‘Sangam literature’. The Chola kingdom was situated in the region between Pennar and Vellaru Rivers. They ruled for a very long time then they ruled as feudatory of Pallavas, Chalukyas, and Rashtrakuts. But in the 9th century A.D. they emerged as great power and ruled over a vast empire which included Sri Lanka, Java, and Sumatra also. The most famous rulers were Rajaraja and Rajendra. Puhar (Kaveripatnam) was the capital of the Cholas. Uraiyur was a city famous for cotton trade. The Cheras or Keraliputras occupied the region consisting parts of both Kerala and Tamil Nadu. One of their most famous rulers was Senguttavan. The great hero Chera king Neduncheraladan, who is said to have conquered many kingdoms and also captured a Roman fleet off the Coast of Malabar. The Pandyas occupied the modern districts of Tirunelveli, Ramnad and Madurai in Tamil Nadu. Their capital was at Madurai. Nadunjeliyam was the most important pandya king. The Cheras, the Pandyas and the Cholas seem to have been at war with one another very often, and there are many poems describing these wars. For many centuries the Tamils lived in this way until the Pallava kings, in the sixth century established a large kingdom. The king was assisted in administration by advisers. There was also an assembly of all the village chiefs called Sabha where important matters were discussed. The ruling class was called Arasar while others Kadaisiyar. Rice, sugarcane, pulses, fruit, and spices were grown. The main items of trade were pearls, precious stones, spices, textiles, timber, ivory, etc. which were in great demand in western countries. Within India, goods from south India were now being sent to the north. The Romans brought to India articles such as copper, tin, lead, glass, wine, ornaments, Pottery, gold and silver coins. The Romans paid for the Indian articles in gold and silver coins. A large number of Roman gold coins have been found in Andhra Pradesh, Tamil Nadu, Karnataka and Maharashtra. Besides Brahmanism, people of the south were aware of the doctrines of Buddhism and Jainism. They were also familiar with worship of Vedic gods. The most popular god was Murugan known as Kartikeya in northern India. They raised memorial stones called Virakkal in the honour of brave heroes who fought and died during war. The heroes were worshipped. The people living on the coast pray to the sea god. The greatest temple of India, the Brihadeswara temple at Thanjavur was built during the reign of Rajaraja Chola. The most striking feature of this temple is its vimana. It is about 65 metres high and is built in such a way that its shadow does not fall on the ground. The pillared halls and the sculptures are fine specimens of Chola art. In one of the halls the various dance postures mentioned in Bharata’s Natyashastra are shown in sculptures. In the inner walls of the shrine there are a number of fine paintings. There is a legend that in the 1st century A.D. a new religion which arose in western Asia, was brought to India. This was Christianity, and it had been preached by Jesus Christ. It was based on the earlier Jewish religion which taught the worship of a single god. In India, Christianity first spread among the people of the Malabar Coast and in areas near present-day Chennai. Inscriptional evidence shows that by the seventh century there were Christian Indian communities living in Kerala. The Pandya rulers encouraged the building of high outer walls with entrance gateways topped by gopurams. Attention was now concentrated on the gopuram rather than the vimana or sikhara above the main shrine. The artistic glory of the gopuram became so popular that it became a special characteristic of south Indian temples. Sangam literature was written over a period of three to four centuries. It was said that many, many centuries ago, three assemblies were held, the third at the town of Madurai. All the poets and birds and wandering minstrels of the south gathered together and composed poems. (According to Tamil traditions, poets and scholars used to assemble at the capital of Chola kings.) They presented their poems in the assembly. At the later gatherings, two thousand poems were collected into eight books. All poems approved in this assembly (Sangam) were compiled in book form, written in Tamil. This body of literature consists of many themes like politics, war and love. The famous works of this body of literature include the Ettutogai (eight anthologies), the Tolkappiyam (a work on Tamil grammar) and the Pattuppattu (the ten songs). Thiruvalluvar wrote the famous Kural which in verse deals with many aspects of life and religion. The Silppadikaram and the Manimekalai are some of the other most famous works of early Tamil literature. The poets moved from place to place composing poems for the chiefs of the tribes. These poems describe the life of the chiefs and of the common people in south India. Sangam literature refers to Romans as Yavanas who came to India, settled and became part of Indian society. Arikamedu in Tamil Nadu is a Roman settlement. Many port towns like Puhar (of the cholas), Muziris (of the Cheras), and Arikamedu (of the pandyas) developed under the patronage of the rulers. Sangam literature mentions five ecological zones. They were: hills and forests (kurinji); pasture land (mullai); fertile agricultural plains (marutam); sea-coasts (neytal); and arid zone.